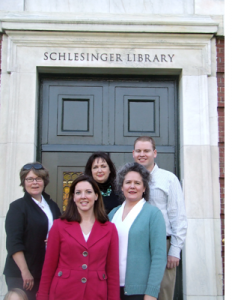 When Feminists for Life President Serrin M. Foster returned to Boston in spring 2010 to address students at several area universities, she and other FFL board members paid a special visit to the Arthur and Elizabeth Schlesinger Library on the History of Women in America. The Schlesinger Library, which is part of the Radcliffe Institute for Advanced Study at Harvard University, is located on the former campus of Radcliffe College in Cambridge, Massachusetts. This newly renovated, state-of-the-art facility houses the world’s largest and most prestigious archive of women’s history. 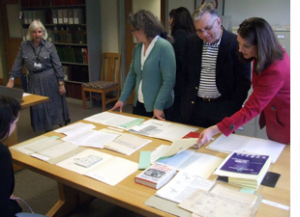 Established in 1958 with a single donation, the Schlesinger Library now includes the correspondence of many of the first women doctors, lawyers, activists, and missionaries. Dedicated to documenting the lives and historical endeavors of women, the library is organized into three major categories: manuscripts (approximately 2,500 in number), books and periodicals (more than 80,000), and photographic and audiovisual material (roughly 90,000). Personal items of well-known and influential women — such as Amelia Earhart’s baby book — are among the rich collection of artifacts housed at the Schlesinger, and a portrait of the aviation pioneer who disappeared while flying over the Pacific graces the wall of the library. The library has two highly distinguished special collections. The first is the culinary collection, which spans five centuries of global cuisine and includes 15,000 books, letters, and papers from such famous chefs as M.F.K. Fisher, Elizabeth David, and Julia Child. When Serrin Foster and FFL Board member Nina Jurewicz first toured the library in March 2009, they were able to view its beloved donation from Julia Child, which includes one of her copper pots, her whisk, and her silver serving spoon. The Schlesinger Library was an important resource for Nora Ephron’s popular 2009 film Julie & Julia. 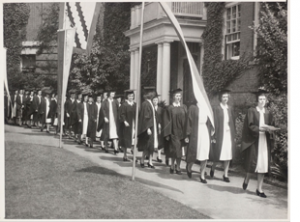 The second special collection, the archives of Radcliffe College, documents the evolution of women’s participation in higher education in America. It includes donations from officers, alumnae, and students of the college from 1879 until its closing in 1999. Although the Schlesinger Library is devoted to the history of American women, it also includes an abundance of material from women of other nations. Letters from missionaries in China, as well as the writings and speeches of Shirley Graham Du Bois, a writer and activist whose work extended far beyond American borders, are found among the Schlesinger’s collections. The world travel collection includes donations from the 1800s to the modern era, providing accounts of women’s travels on foot, in covered wagons, and by ship, car, and plane. Travels from the U.S. to Europe, South America, Asia, Africa, and Australia are shared by women of diverse socioeconomic backgrounds and motivations ranging from activism to personal exploration. Of special interest to members of Feminists for Life are three diaries, seven speeches, and several items of correspondence from Susan B. Anthony. 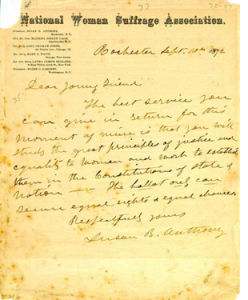 Some collections contain correspondence from Elizabeth Cady Stanton and Alice Paul. Anthony died before she achieved her most cherished goal — women’s suffrage — and passed the responsibility on to Paul and other leaders of the movement, who successfully advocated for passage of the 19th amendment in 1920. Dr. Mildred Jefferson, the first African-American woman to graduate from Harvard Medical School and the cofounder and past president of the National Right to Life Committee, recommended that the Schlesinger seek Feminists for Life’s archives for inclusion in their collection. The Schlesinger Library has also invited Serrin to donate her personal records for a separate collection. On April 30, 2010, Kathryn Allamong Jacob, Curator of Manuscripts, led FFL’s Board of Directors, Serrin Foster, and me on a tour of the Schlesinger. During our visit, Ms. Jacob revealed boxes of exquisitely made suffragist buttons and other precious memorabilia and carefully explained how the collections are preserved as she took us through a maze that included records from the “Speculating Squirrels” (women investors from the mid-20th century), the Boston YWCAs, Lamaze, and other women’s organizations, as well as a special collection of cookbooks. The highlight was a special exhibit thoughtfully displayed for our visit by reference librarian Sarah Hutcheon. 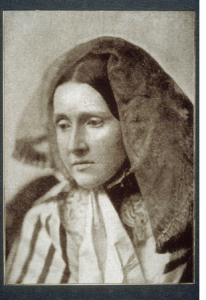 The first table focused on suffragists of the 1800s and included a letter from Julia Ward Howe criticizing the editor of the Atlantic Monthly for not including her poetry, a letter from Elizabeth Blackwell to her sister Emily (who was also a doctor), one of Susan B. Anthony’s diaries, a letter written by Victoria Woodhull from jail, and Volume IV of the History of Woman Suffrage by Elizabeth Cady Stanton, Susan B. Anthony, Matilda Jocelyn Gage, and Ida Husted Harper, with an inscription by Susan B. Anthony. The second group of historical documents was from the 20th century and included a letter from suffragist Alice Paul when she was just 25 years old, informing her mother that she was well after a recent prison stay. Another letter from Alice Paul to a “captain” (perhaps a police captain), however, told the real story. In this letter, Paul described how she was sentenced to hard labor in Holloway Jail in England and her hunger strike, which resulted in force-feeding. 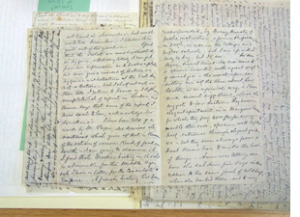 We also viewed a letter from Jane Addams written on Hull House stationery and Julia Child’s handwritten omelet recipe. The last section of the exhibit displayed Feminists for Life’s own publications — both Sisterlife (which was published until 1994) and The American Feminist® (1994-present). FFL’s donation to the Schlesinger will also include archival photographs, press clippings, the text of the FFL-drafted Elizabeth Cady Stanton Pregnant and Parenting Student Services Act, Serrin’s landmark speech “The Feminist Case Against Abortion,” and audio and video recordings of speeches and interviews with Honorary Co-Chairs Patricia Heaton and Margaret Colin, as well as the lectures of additional Feminists for Life speakers. These donated materials will highlight the organization’s history of advocacy on behalf of pregnant women and parents, women living in poverty, and women who are victims of domestic violence and sexual assault. The collection will include a description of the many achievements of FFL’s flagship College Outreach Program, focused on educating students about more than two centuries’ worth of pro-life feminist history and developing on campus resources for pregnant and parenting students. Feminists for Life’s advocacy efforts on behalf of college-age women — those at highest risk of abortion — have inspired many within the pro-life movement to redirect their efforts and likewise focus on the need to provide support and services to pregnant women and parents. Sharing our country’s rich pro-life feminist history with hundreds of thousands of college students through its lectures, conferences, and pregnancy resource forums, FFL has challenged those on college campuses to refuse to choose between women and children. During the first 10 years of FFL’s College Outreach Program, the abortion rate declined in only one group — college graduates — by a remarkable 30 percent. 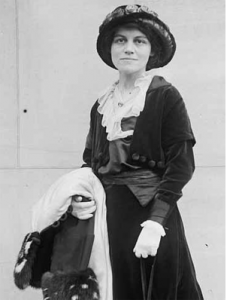 Suffragist Sarah Norton, who together with Susan B. Anthony argued for women’s admission to Cornell University, dreamed of a day when “an unmarried mother will not be despised because of her motherhood… and when the right of the unborn to be born will not be denied or interfered with.” In recent years, FFL has seen a surge of pro-woman, pro-life student groups on campus. From Wellesley, Harvard, and Stanford to Georgetown, Berkeley, and Loyola, student activists have been empowered by our conviction that women deserve better than abortion. Through their impassioned work to ensure the rights of women and the protection of children from all forms of violence, these students, working alongside Feminists for Life, are writing yet another chapter of women’s history, one that may someday take its place at the Schlesinger Library. Editor’s note: If you have any copies of Feminists for Life’s Sisterlife newsletter, Green Sheets, other early publications or correspondence, pre-1994 press clippings, or FFL memorabilia that you would be willing to add to FFL’s historical archives, please send them to Feminists for Life, P.O. Box 320667, Alexandria, VA 22320. Librarians request that you do not send anything directly to the Schlesinger Library; all contributions must be sent through Feminists for Life.